In my last volleyball update I mentioned that J wants to do club volleyball. We asked around and decided to try Northeast Thunder Volleyball Club. Every volleyball parent we asked said it has a good reputation, the parents we knew who’d been involved with the club all recommended it, and practices are often pretty close, in Scotia. We attended a meeting a few weeks ago for returning and prospective club members, and J was excited to see a 7th grader from her school team at the meeting as well. We learned that our timing was pretty good: J’s in the age range for the U13 team, which is the first team that they offer after doing clinics for the younger kids, and it’s designed to be “developmental” for newbie players. At the meeting there were tons of older girls who were clearly old hands at volleyball, sporting their volleyball tournament t-shirts and their IREVA gear. For the older girls, there are two teams in each age group: a “thunder” team that’s more advanced and the “lightning” team that’s less advanced but still competitive enough that they apparently win a lot. 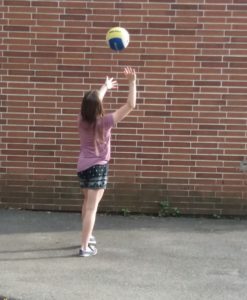 At the meeting, they told us about a series of three Sunday afternoon try-out dates, and they said that there would be cuts, but they’d help any girls who were cut to find somewhere else to play volleyball. We went away from the meeting feeling pretty good, though, because we got the impression that the beginner 13s team typically didn’t have too many girls trying out, so cuts might be unnecessary at that level. J’s also been practicing. J’s first try-out was on Sunday, September 24, and it was a little high-stress. 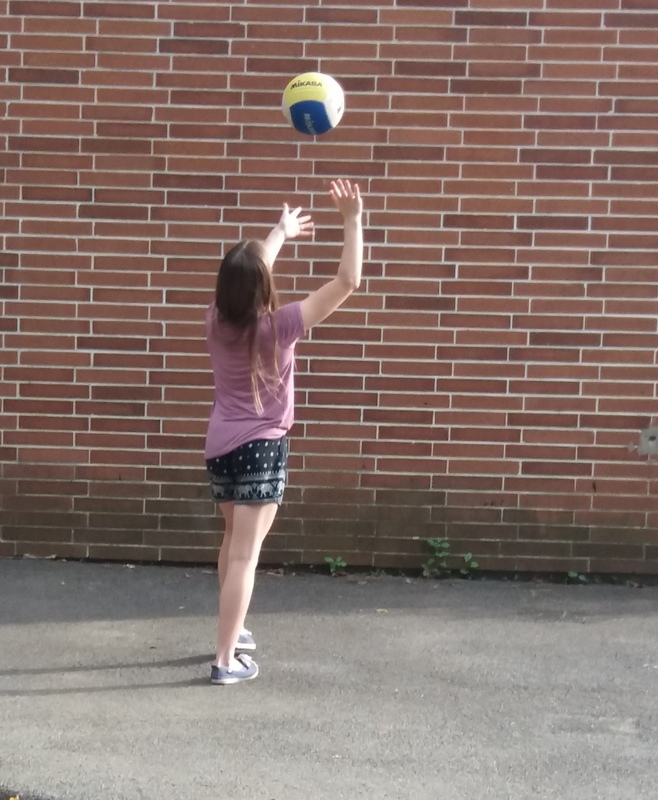 First, I discovered that even though I’d filled out paperwork in person and joined USA Volleyball online, I’d missed some online registration step, which meant I had to pull out of line and fiddle on my phone while J waited, all tense and wishing that her mother were more competent. Then, in the gym, it just seemed like there were a ton of girls. The 13- and 14-year-olds were trying out at the same time, which made a pretty big group. Once J trotted in and started warming up I left, because frankly it wasn’t too good for either of our nerves for me to stay and watch the whole time. Cute W and I returned for pick-up a little bit early at the end. 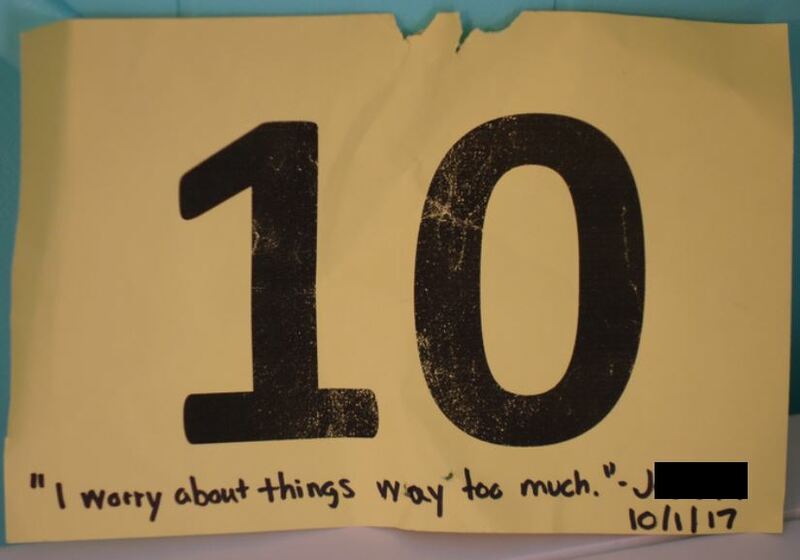 J was wearing a yellow number 10 along with a bunch of other 13s who numbered 1 to 15, and they were quickly rotating onto and off of the court in a hectic game of volleyball that seemed designed to let everyone play and help the coaches see who was paying attention. We saw J hit the volleyball once, maybe, and she got an opportunity to serve in which she smacked the ball into the net, tried again and smacked the net again, tried again and smacked the net a third time. Oy. Still, overall, Cute W and I were feeling vaguely optimistic. While J didn’t knock us out with her skills, neither did any of the other 13-year-olds, really, except maybe one or two. We both thought that J looked more athletic and attentive than many of the girls, which seemed to bode well. Even her three-time serving fail didn’t seem all bad, because the coach had asked her to keep trying instead of moving on immediately, like he had for some of the other girls. J was unconvinced. As we should have expected from, well, living with her for almost thirteen years, she was disappointed in her performance. Even worse, she was already dreading the next week. “The coach said that we’d only need two try-outs, so we’ll find out next week. And he said that there will be cuts,” J told us. There was a pause. We all knew that the next Sunday was October 1st. “I don’t want to get cut from the team on my birthday,” J moaned. J spent her birthday morning not eating Cute W’s special waffles because they might weigh her down and not playing outside for fear of tiring herself out. Cute W drove her over in the late morning only to learn that the time had changed (they’d announced it on the website, which we hadn’t checked), so they came back home to wait around some more. Then I dropped J off and fled the premises because at this point the tension was killing me, especially when I noticed that new girls were registering to join the try-outs. I returned to pick her up about five minutes prior to the end of try-outs. It was super-busy, because J’s try-outs were followed immediately by an older girls’ session, so there were younger girls still playing, older girls arriving, and parents milling around. I caught sight of J across the gym in a big mess of girls who were doing the same jump in, jump out of the game activity we’d seen last week. She was waiting for a turn to play, then something happened and the group broke up, and I saw J run off to retrieve some errant volleyballs. Then I looked over my shoulder and I realized that almost all of her group were gathering together on the other side of the gym with their coach. Crap, what? I looked. Yes, these girls had yellow numbers; yes, here was J’s friend from school. . . . I was confused. J looked like a hanger-on with that other group. Was she lost? I sidled over toward the coach with J’s group of 13-year-olds to eavesdrop. “You’ve all made the team,” he told them. No. No. No. I looked over and there was J, who, after high-fiving a grown-up, came hustling over to rejoin her group near me, where the coach was still talking. She was listening, but she’d missed that crucial first part about how he’d just told everyone else that they’d made the team. The coach told the girls to find their parents and bring them back to him. J turned and saw me right there, and I came over quickly, hoping to clear the confusion and exit before J had a chance to process the situation and start crying in front of everyone. You know, on her birthday. When I told him that my daughter had been practicing in the other area and that she’d missed what he’d been saying, he told us to go speak with the other grown-up that J had just high-fived before hustling over. I trotted over to ask this other person, who turned out to be an assistant coach, but meanwhile I didn’t want to break it to J that she wasn’t on the team, so I sent her to the bleachers to get her stuff together. It was clear to this nice woman that I thought that J had been cut, but I was wrong. Oh, no. It turns out that they had pulled J over to work with the older girls because she was especially good at volleyball, and she would be joining the more advanced 14-year-old Lightning team! The coaches hadn’t told the 14-year-old girls which specific team they’d be on yet because of course if you were an actual 14-year-old, you were in suspense about making the “A” thunder team or the “B” lightning team. But since J’s a 13-year-old, making 14 Lightning is plenty awesome enough for her. Especially when moments ago I thought that she’d been cut and she thought that we’d screwed up the registration and her age placement was incorrect (which is what she was guessing from the bleachers while I was acting all tense and talking to coaches). So: hooray! I feel silly because it honestly hadn’t even occurred to me that this was an option. If I’d actually stayed and watched the try-outs the whole time I probably would have gotten clued in (no guarantees), but again, what the heck do I know about volleyball? After we finally figured it out, J and I walked to the car restraining ourselves among her fellow volleyball people, then hooted with joy as we drove home. 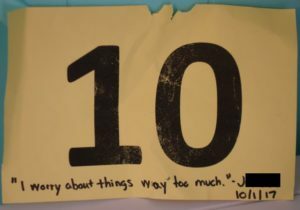 She said something about worrying too much, and I vowed that we’d post this quote prominently for her to keep in mind next time. On the way home we decided to tease Cute W by pretending that the try-out hadn’t gone well, which required me to repeatedly practice saying “She didn’t make the 13 team” without breaking into a wide smile. I insisted that J jump in immediately with the news so that he’d only have that heart-sinking feeling for a second or two. When we walked in we saw M first, who was dying to know, too, of course, and found it pretty annoying that we bypassed her to play the joke on Cute W. But soon enough we all celebrated together and finally ate some birthday waffles. I love the souvenir number and quote. A very happy birthday to J!